The arch rivalry between the two nations has always resulted in India v/s Pakistan cricket matches being billed as amongst the greatest sporting rivalries in the world. 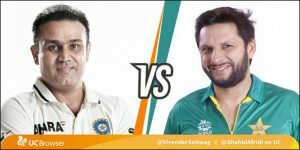 VirenderSehwag and Shahid Afridi, known as on field enemies and off field friends, will discuss and debate over a host of topics in relevance with the game and share their personal match experiences with cricket fans on UC. Cricket lovers can expect the two cricketers, known for their swashbuckling and aggressive on field performances during their playing days, to bring the same aggressive intent and passion on UC’s online platform. Also, they will be enjoying imitating each other with high spirits, trying tongue twisters and will speak in Punjabi and Pushto language and will recite some never heard dressing room secrets.